My name is Marichka and I live in Wash- ington, DC. My father works at the Em- bassy of Ukraine in the U.S. He is responsible for economic affairs. And I know that our family is on a very important mission here – we protect the interests of Ukraine! Ukrainians were among the first, who came to North America. In 1608, Ivan Bohdan sailed here together with John Smith, British traveler and explorer, who is now considered a national hero in the US for having founded the first English settlement. Migration was most active before the World War I: Western Ukrainians went abroad in search of a better life. Those many Ukrainians, who had contributed to the development of the United States, have become a signifi cant part of American history, science and culture. Father told me and I know that the United States is Ukraine’s friend that we learn a lot from. The United States is a great country and I feel it while living in Washington, DC. 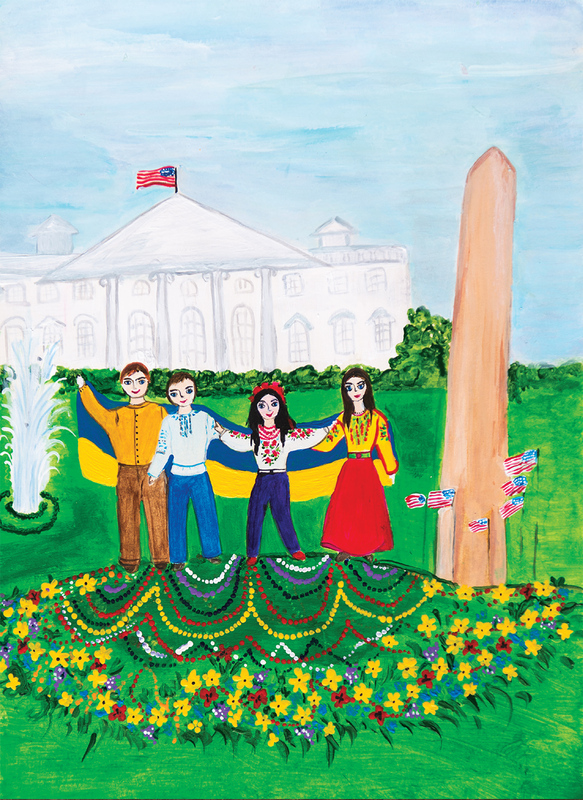 I drew the most famous symbols of the United States on the painting – the White House and the Washington Monument. I love walking in the park and sitting on the lawn near the residence of the President of the United States with my family. It’s so simple and nice that you can visit places like these without any restriction. You feel that the state is open and friendly to people. I captured this on my painting.